Ollie Gleeson still remembers the day he was asked to give the answer to a maths question in class — and although he knew the solution, he couldn’t say the word, due to a crippling speech impediment. The letter ‘h’ was often impossible for him to say and he could not utter the word ‘hundred’. After what seemed like an eternity, under the critical gaze of his classmates, he came up with a way round the problem. “One, zero, zero,” he said, before sitting down. It was one of the toughest moments of his young life. 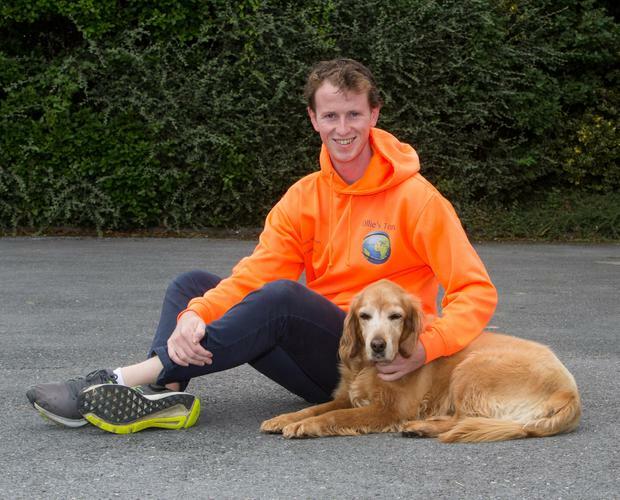 “As far as I know, I’ve had a stutter for my whole life,” says the 22-year-old Clare man. “It isn’t something that runs in the family, so I don’t know where I got it from, but it started getting really bad when I was a young child and I developed a coping mechanism of making really long sentences in order to avoid words that I couldn’t say. “Over the years, my parents tried so many different treatments for me, including speech therapy, acupuncture, craniosacral therapy and even hypnosis — but none of it worked. It was very difficult at school and, of course, I got a fair bit of stick for it. Ollie, who is the middle child of three, admits to changing his name when he was on holiday or with strangers as his own name was often too difficult to pronounce — but on one occasion, having to be ‘David’ for an entire vacation saw him own up to his new friends about his condition, and this was the first step towards gaining some control over his problem. “I realised that it was probably good to let people know that I had a stutter rather than trying to hide it, as the stress of that made the whole thing worse,” he says. “Then, when I was 16, my parents signed me up to a course on costal breathing in Galway, and this was when everything started to change. It was a four-day programme — we had to get up at 6am and go to bed at 10pm and the entire day was spent learning how to breathe and speak as if it was the first time. “We had to wear a belt on our chests which would determine whether or not we were breathing properly and had to endure some of the toughest situations I have ever been through — which included speaking in a really slow, drawn-out fashion to 100 people on the street, telling 10 strangers each day that I had a stutter, and standing on a soap box in the middle of Shop Street and shouting out that fact to everyone passing by. Since this four-day course seven years ago, Ollie says he has learnt how to confront the issue and ‘take control of the fear’. “The experience in Galway was pretty embarrassing, but it was worth it as it taught me so much,” he says. “I learned how to laugh at myself and that some people have it a lot worse than I do. I also realised that the best way forward was to tell people that I have a stutter rather than desperately trying to hide it. “In fact, when I gave my first presentation in college, I began by putting up a photo of myself in mid-stutter. People were perplexed at first until I told them that they were likely to see me in that pose at some point as I had a stutter — this immediately changed the situation — people started to laugh and most were really supportive. As his speech issue became less pronounced, his confidence began to grow and in connection with his college course, when he was 19, Ollie applied to work in Germany as a tour guide. “This was a huge step for me as not only did I have a stutter, but my German wasn’t brilliant and I didn’t know too much about the place either,” he admits. “I fired off some emails in perfect German (thanks to a little help) and was delighted to be offered a job in Munich. Buoyed up by his experience in Germany, when Ollie returned to Ireland, he set up a walking tour in his home town of Ennis, Co Clare. “When I was young I wanted to be a radio DJ, but the stutter put paid to that, so after my stint in Munich, I decided that I wanted to be a full-time tour guide,” he says. “I started olliestours.com last year when I was still in college. My tours consist of a guide on foot through the main sights and then for those who are interested, I offer an extra ‘cultural workshop’ where I teach visitors some Irish basics — a few words, a demonstration of how to hit a sliotar and play Gaelic, some well-known songs and also a bucket list of my top Irish foods that they can sample on their trip around the country. “It’s been going really well so far — I usually have about five or six people [about 90pc are retired Americans] but I have had groups of 40 and once took 100 people around the town, split into groups over the course of three hours. Dr Jonathon Linklater, speech and language therapist, says certain situations can exacerbate speech problems such as stammering and while there is no cure, people like Ollie can learn how to deal with it. “There is no ‘cure’ for stuttering, or stammering, as it is also called, but there are ways to manage to lessen the impact,” he says. “In the early years, speech and language therapists [SLTs] typically work with children and families to promote a positive communicative environment and to enhance fluency. There is evidence to suggest a genetic disposition towards stammering but there is no single cause. Around 5pc of children are affected between the ages of two and six years, but four out of five of these will resolve naturally. For the 1pc who don’t grow out of it, the expert says help is available. “The Irish Association of Speech and Language Therapists would recommend getting in touch with local speech and language therapy services for both children and adults,” he says. “Developing a supportive and understanding environment for communication can have a positive effect on a child’s speech and language skills so don’t correct anyone who shows signs of stuttering and don’t put pressure on them to talk quickly.